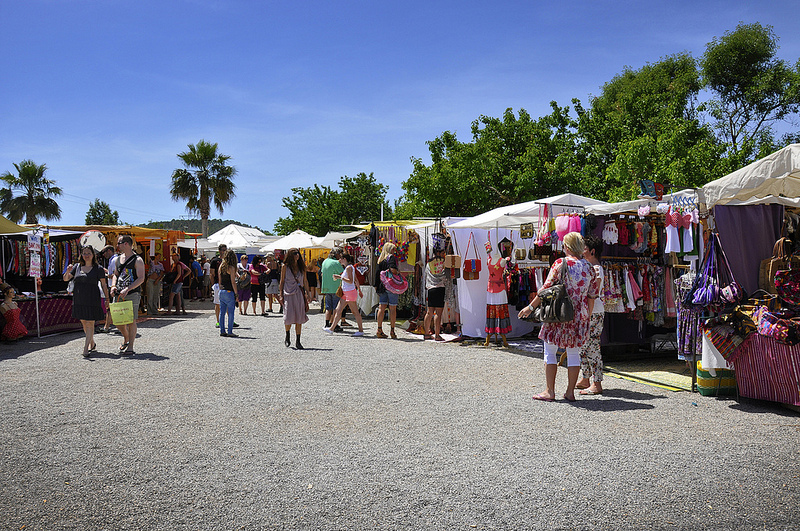 The legendary Ibiza hippy market is a must-visit on the summer circuit, but a little known fact is that it remains open every Saturday all year round, including a two-week stint as a Christmas night market in December. The off-season offers all the same artisan products, clothing, jewellery, art and more… and the marketplace is still drenched in sunshine (though you may want to wrap up in a scarf! ), while the indoor restaurant is the perfect place to fuel up on tapas post-retail therapy! This year-round flea market just metres before the parking area for the northern beach of Cala Llenya is chock-full of ex (or ageing!) hippies selling their wares, from fur coats and jewellery to unique vinyl, antique furniture and amazing art every Sunday. Arrive early to score the best bargains, then ensure you’re first in line for the legendary giant paella at lunchtime. As the sun sets on the prettiest, most social plaza in Ibiza town, the island’s artisan’s begin to set up shop for the evening, with an array of jewellery, art and craft stalls lining the square every Saturday night. From quirky rings and necklaces to wooden sculptures, hand-knitted scarves and more, each find is unique and made with love right here on the white isle. Sunday mornings in the pedestrianized main square of San Juan village are all about peace and love baby! Throw in organic coffee and cake, leather goods, second-hand books and vintage clothing, and you’ve stumbled across the island’s most authentic gathering of bohemian types!